Lepa sends me a black and red news photo of a night of mass demonstrations in Belgrade. I can feel the heat of the night, the heat of so many bodies pushing forward into history. A city setting itself against the rule of one man. And in among the thousands are Lepa and her lesbian friends, her feminist friends, some of whom I have seen in grainy black and white playful images on my small screen. I sit in my New York apartment, seeing the images of national courage. Because I have a new lesbian friend. 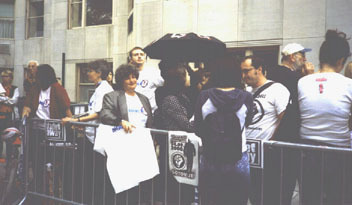 On September 16, I participate in a demonstration in front of the Yugoslavian embassy on Fifth Avenue. A cool New York Saturday filled with people in the streets. I had to walk long detours to reach the barricades; the annual Steuben Day Parade, the celebration of German culture, was starting to flow down the center of the avenue. Cordoned off in a small square were about 40 people, holding banners that said in Serbian No more, its timeyoung men and women holding each other. I see them, intent and passionate, sitting at small tables in Belgrade cafes, smoking and drinking coffee, talking about politics and art, the economyand then I realize these are dream visions, my American mythic images of how history resonates in Europe. Indira, one of the organizers of the Women in Black vigils, and Lepas friend, moves through the crowd, kissing friends, thanking every one, looking at her watch so she will not be late for her next meeting. I have come to know Indira, standing next to her at Women in Black vigils on the steps of the 42nd Street library in New York. There she stands, holding the banner, often with one arm wrapped around her other, a pensive, beautiful woman looking out at strangers, as she quietly demands attention be paid. Now I stand again, so new to this world of struggle, watching friends embrace, seeing another history take face and sound. A tall blond woman in open-toed heels, her skirt flecked with orange wheels, speaks to me in Serbian. I tell her I am American and she switches to English. She too knows Indira, I tell her about the Women in Black vigils, she tells me of her aged parents in Belgrade, her fears for them, how people who oppose Milosevic have started disappearing off the streets. She is here studying in graduate school. After all the leaflets have been given out, we lean on the barricades together and watch the parade go by. Then Indira and others call out to their comrades, including my new friend; it is time for these citizens of FR Yugoslavia to cast their votean act of resistance in the sunlight of Fifth Avenue. One by one they drop their ballots into a shoebox made into a voting booth. When all have voted, they form a procession and march to the embassy to deliver their message. The voting done, people slip under the barricades and disappear among the crowds gathered to watch the parade. I walk down to 65th Street, wondering how will I get homeI am leaning against the marble wall of an imposing building when I look up and realize it is Temple Emanuel, the largest synagogue in New York, with its huge stained glass Star of David looking out high above the avenue. German Americans in Bavarian shorts and dirndls riding on beer garden floats, martial bands drumming, community groups bearing wooden rifles with sprigs of green stuck in the barrels, members of secret societies with huge peacock-plumed hats and medals dancing on their chests. My legs ache and I am trying to find a break in the parade so I can dash across the avenue into Central Park and make my way home. The police finally wave permission. I walk home in the middle of the road that is usually clogged with buses and taxis. A strange place it seems now, with the sounds of trumpets and drums fading away behind me. I walk straddling the yellow lines that usually keep the opposing lines of traffic from colliding, balancing with my cane. I am overcome by the layers of history I have seen, and how once I left the sight of confrontation and celebration, it all became ghost-likethe exiled citizens of a country shattered by hate, the parading Germans, the silent Jewish synagogue. Then I think of Indira and Lepa, the young men and women marked by their struggle, the blond woman flecked with orange, vulnerable and strong all at once, worrying about her family back in struggling Belgrade, the pain in my legs and my fervent desire to get home. Never let history become a home of ghosts. It is a living place for all uswhere we ache or struggle or turn away but never pass unmarked.